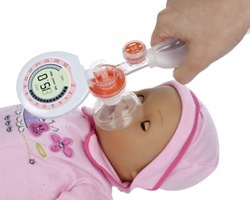 The first manual resuscitator with volume specifically designed for premature and newborn babies under 5 kg. The current neonate resuscitators available today are generally for babies under 10 kg but this volume exceeds the acceptable volume range 10 ml/kg for smaller babies. For this reason, the medical personnel often resuscitate the babies based on their own experience. With the 20 ml and 50 ml optional delivery volume design, our nBag increases safety and ease the operation during the emergency situation. A safer resuscitation device for premature and newborn infant up to 5 kg. 2 pressure limit levels to minimize the risk of lung injury. Pressure monitoring port ensures the pressure in the patient side. Highly efficient and flexible oxygen reservoir system provide convenient and easy operation. Swivel patient port for more operation flexibility. Biocompatible, latex free and Phthalate free silicone material not only reduce the risk of allergy or infections but also provide better patient feedback. Patient Connector: ISO 15 mm I.D.